A documentary about “the most blacklisted author in the history of Iowa,” Zielinski toes the line between black comedy, government conspiracy theory, and poignant portrait of the artist as an old man. The film’s directors, Ryan Walker and Chase Thompson, embarked upon the film after meeting John M. Zielinski in Columbia, Missouri. I caught up with Ryan to find out more about public access television, conspiracy’s funny side, and the man behind the rhetoric. So how did you and Chase meet? And how did you get into public access television? We met through music. We both used to be more into music than film, really, and we played in a couple bands together. He was making a show on public access that was really popular in Columbia, and he was kind of the first one to make local music videos, about five or six years ago. It was pretty popular, and I got involved with that, and we both started learning through CAT [Columbia Access Television] and working at CAT and being on the Board of Directors. Then I was full-time staff there for three years and he was the Board President, so we were really involved with that and still collaborating on things and giving each other feedback. Before public access, there really didn’t seem like there was any chance to make anything, let alone a film. I couldn’t afford a camera, couldn’t afford software, the door was closed completely. I was on the outside looking in. Public access really opened the door. How did you get interested in Zielinski? John Zielinski came in and tried to join [CAT]. Well, first, he walked in and was holding this big, muddy VHS camera and said, “there’s a tape in here that will bring down the U.S. government. Can you help me?” So that kinda made us laugh, and Chase helped get this tape unstuck from the camera, and it was actually Conspiracy of Silence, the tape that was stuck in there, and that finally made it into the film. That’s how we met him, and he kept coming in, and he comes on really strong when you meet him, but since it’s public access we’re sort of forced to listen to him. And we got through the first few layers and sooner or later we’re just looking at each other like, are you listening to this guy? He’s really entertaining to listen to and he’s saying all these bizarre things and bringing in great photographs. There’s just so much great material there. So we set out to make just a short, five, ten-minute thing, but after a while realized there was much more to the story than we [initially] realized, so we went on to make a feature. We just wanted to share him. He wanted us to make an exposé on human trafficking and all this stuff, and he wanted it to be a real cause film, and that never really interested us. Although, those causes are important and they’re serious, but we were interested with him, and just thought he was a fascinating guy and really entertaining to watch. So we just tried to tell his story and we think there’s a lot of neat photos and neat videos that he brought in. To us, there’s a lot of funny scenes in it. There’s some serious stuff, but we laugh when we watch it. We hope that people see the humor and are interested by his story. Why did you structure the film the way you did? The way you unfold the story isn’t entirely conventional. Well, that was a long time in the making. That went through a lot of different structures. It took us a long time to really figure out what the facts were. So we eventually tried to do a chronological story just to make sense of it, and then we realized that wasn’t very dramatic. It wasn’t as interesting when it was all laid out one thing after the other. Eventually we decided to structure it the way we experienced it. It starts off really jarring, with John in your face, kinda shouting at you, and saying all these, I don’t know what you want to call them, conspiracies about human trafficking, and “pedophilia owns this nation,” and stuff like that. So we keep peeling layers away and find out more and more about him, and there’s way more to him than that, even though that’s all he wants to talk about. So that’s want we finally decided on, to structure it the way that we found him. What have audience and critical reactions been like so far? Very positive. All the screenings we’ve had, people have been really engaged by it and we’ve gotten a lot of positive feedback. Some people want it to be more of a cause film. We package it as a conspiracy theory type of thing, but that was just the hook to get people interested. Some people want it to be more this or more that. We played at Flame Dance and True/False [film festivals], and probably 1500 people or so have seen it in screenings and we’ve gotten some positive reviews. A lot of the footage is old, we didn’t shoot it in HD, it’s not very gimmicky or anything like that. It’s not a glamorous film. I think it’s going to be a slow burn for people to catch on and build it by word of mouth. We’re happy with what it’s done so far. It’s done a lot better than we expected, really. What did you learn from making the film? Is this going to lead to more filmmaking? Well, we kind of started from scratch. Coming from public access, we didn’t go to film school, we just kind of figured this stuff out on the fly. You can even watch the technique evolve as the film goes on. A lot of the early interviews are pretty crude. We really came from nowhere to make the movie we made. And it goes back four years, when we started making it. So now it’s really going from no knowledge at all to now we’re starting new projects and using better equipment and going through the process of editing we learned so much about how to structure a film and made so many mistakes that we’re starting our next project in a totally different place. We’re both starting new documentaries. I’m making one actually set in Western Illinois, called The Bootlegger, and Chase is working on several projects. So we’re gonna keep going on. 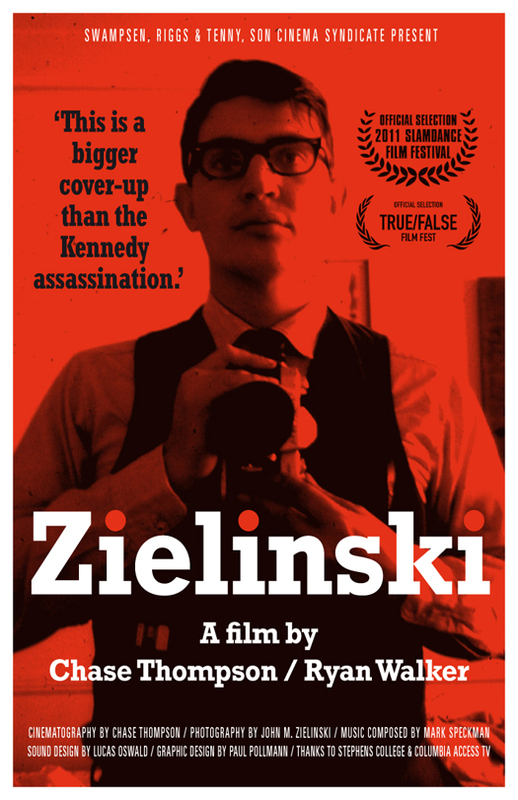 Zielinski will be screened at Chicago Filmmakers, 5243 N. Clark St., Friday, Dec. 2 at 8pm. For more information about the film, click here.